Let's talk about laccoliths. First off, what is a laccolith? Where can I find a visible example of one? In response to the first question, according to http://en.wikipedia.org/wiki/Laccolith a laccolith is an, "igneous intrusion (or concordant pluton) that has been injected between two layers of sedimentary rock. The pressure of the magma is high enough that the overlying strata are forced upward, giving the laccolith a dome or mushroom-like form with a generally planar base." 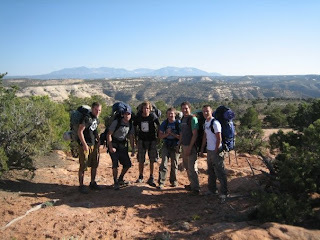 As you can see behind the really cool dudes in this picture there lies a mushroom-like looking mountain, here, in is this case, it is the Blue Mountains, or the Abajo Mountains, in Southeastern Utah (the answer to the second question). As the definition states, a laccolith is an igneous intrusion, thus forming underneath the crust. Magma then pushes the laccolith upward along with the overlying sediment. Over a long period of time the sediment above the laccolith is then weathered away and the harder, igneous rock of the laccolith is left behind, finally exposed.